Interpreting as outdated and changable by interpretation the written Constitution's enumerated nature, Preamble's Divided Sovereignty, "post Roads" restrictions, "harbors" restriction, Amendments 9 and 10 of the Bill of Rights. Federal government taxing and building oil and coal fired infrastructure. Ignorning the vetoes of 5 Presidents of "internal improvements." 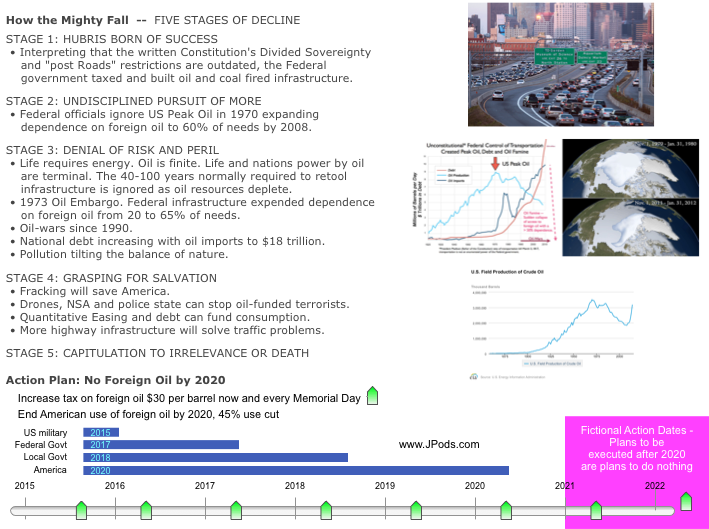 Federal officials ignore US Peak Oil in 1970 expanding dependence on foreign oil to 60% of needs by 2008. Life requires energy. Oil is finite. Life and nations power by oil are terminal. The 40-100 years normally required to retool infrastructure is ignored as oil resources deplete. 1973 Oil Embargo. Federal infrastructure expended dependence on foreign oil from 20 to 65% of needs. National debt increasing with oil imports to $18 trillion. Pollution tilting the balance of nature. Drones, NSA and police state can stop oil-funded terrorists. Quantitative Easing and debt can fund consumption. More highway infrastructure will solve traffic problems.